The Asha 501 has a 3.15 MP camera which is capable of capturing images of up to 2048 x 1536 resolution. The camera interface is simple - it offers a virtual on-screen shutter, a toggle for switching between camera and camcorder and a gallery shortcut. Upon a tap you get a zoom slider and the additional settings option. There you'll find adjustable white balance, self-timer, live effects and shutter sound, which can be disabled too. You can also preset the resolution of the images with a choice between 3MP, 2MP, 1MP and VGA. As the specs suggest, images produced by the Asha 501 aren't anything worth writing home about but they will do for the occasional visual memo (not for fine text though - no autofocus is a deal-breaker here) or contact picture. There isn't too much fine detail, but there are occasional purple fringing, over sharpening and pink spots. The colors are nicely punchy though. 3MP shooters are getting very rare these days, but there are still plenty you can compare the Asha 501 against. When it comes to video capture, the Asha 501 was way out of its depth. The camera can produce QVGA (240 x 320) videos with a framerate of 14fps. Sound is recorded in mono at 31Kbps and a sampling rate of 16kHz, the video bitrate hovers around 400 Kbps. As you can tell, those videos are hardly good for anything and we can't see anyone actually using their Asha 501 for video capture. Still if you are interested in the results you might check out this untouched QVGA@15fps sample video. 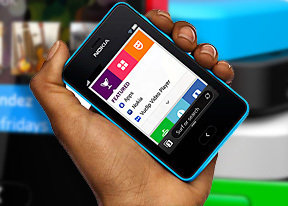 The Nokia Asha 501 is a dual band device (900 / 1800) and offers GPRS and EDGE class 12. There's no 3G (HSDPA) or Wi-Fi on board. Then there's Wi-Fi b/g, which will get you faster data speeds and it doesn't eat into your data plan (if you have one to begin with). Bluetooth 3.0 with EDR handles things like wireless handsfree dongles but also local file sharing. The Asha 501 uses a microUSB port for both data connections and charging. There is no USB on-the-go support, though. The 501 also has a memory card slot (and a complimentary 4GB microSD card). Coupled with a card reader it can usually give you the fastest data transfer rates. And finally, there's the standard 3.5mm audio jack. The Asha 501 has Wi-Fi, but sadly no 3G data speeds. Still, the Nokia Xpress browser uses server-side compression so it offers a passable experience on EDGE networks. There's tabbed browsing and you can save favorite websites as tiles in an Opera-like speed dial. There's a neat start page with categories such as Featured, Mail, Sports, Social Networks, Entertainment, etc. The pull-up context menu gives you quick access to recent, favorites, downloads, web apps and more. The settings of the browser let you choose the quality of the preloaded images, from lower to best quality. Images can be disabled altogether too. There's a password manager as well. The browsing experience isn't spectacular on the Asha 501. Pages load reasonably fast but don't look their best on the tiny 3-incher of QVGA resolution. Still, the Asha 501 will certainly let you check the score of your favorite team's last game or browse through the news websites.